Yesterday (Thursday, December 19) the Pennsylvania Supreme Court declared a major provision of the state's Act 13 unconstitutional. Act 13 was signed into law by Governor Tom Corbett nearly two years ago and allowed gas companies to drill anywhere, overriding local zoning laws. 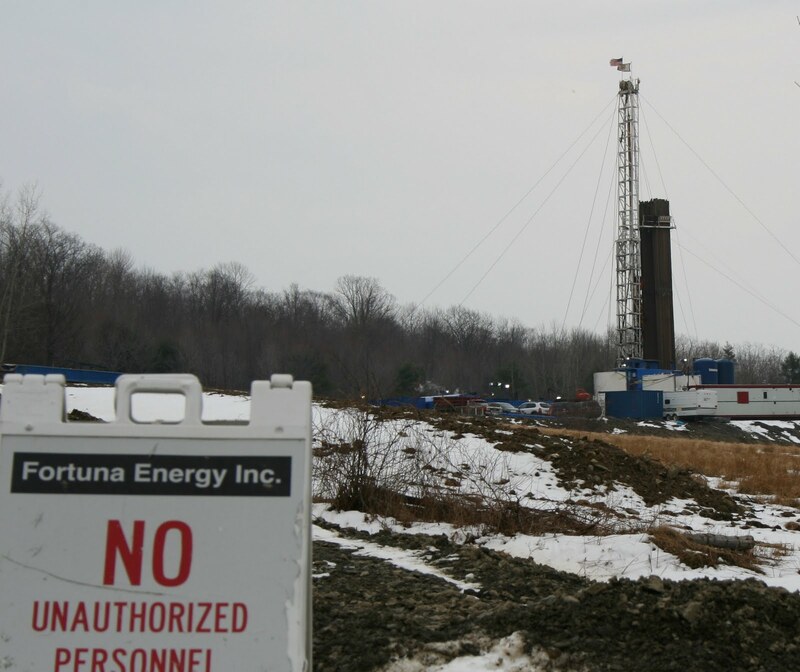 Provisions in the law also prevented doctors and other health professionals from advising patients whose health was affected by gas drilling activities. Thomas Linzey, the Executive Director of the Community Environmental Legal Defense Fund (CELDF) based in Mercersburg, PA, told the press that the ruling is "a significant victory for municipalities seeking to regulate the placement of oil and gas wells and other structures on the surface of land." While the Supreme Court ruling doesn't prohibit fracking, it does support zoning of surface uses. You can read the entire decision here. More about the court's decision here. When asked about whether NY will allow high volume horizontal hydraulic fracturing (aka: fracking) Governor Cuomo is fond of saying “Let the science decide”. But the truth is, science can’t “decide”. The best science can do is present the facts, such as they are known. Policy-makers are the ones who “decide”. And now there’s a new book about the science of the shale beneath our feet – a book that could help our local and state legislators and regulators put more science into their decisions. 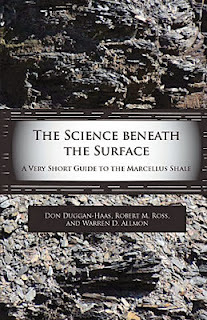 The Science Beneath the Surface: A very short guide to the Marcellus shale was recently published by the Paleontological Research Institute. PRI has a long history of addressing contentious issues, such as evolution and climate change. Now add shale to that list. This book grew out of a project to create fact sheets to inform residents about various aspects of shale drilling. The authors – Don Duggan-Haas, Robert Ross, and Warren Allmon – added new information and a lot more depth to make the book. Unlike the earlier projects on evolution and climate change, where there is little scientific controversy about the major points, there are still significant gaps in the basic knowledge about Marcellus shale - and significant disagreements about interpreting the data. Shale science is grounded in the rock, but research on gas extraction goes beyond geology. It includes environmental studies, land use, agriculture, water, air, human health, engineering… and each of those could demand an entire volume of its own. But Duggan-Haas, Ross and Allmon wrestled the information into one volume that explains the basic science of shale, drilling, water, risk and climate change in language that the average reader can understand – and does it without advocating for or against any particular action. The authors describe the geology and natural fracturing of the formation, discuss Naturally Occurring Radioactive Materials (NORM) and why these are important to soils, plants, animals and people. They also address the volatile organic chemicals released during gas extraction and production. Want to know how to drill a well? Read chapter three. 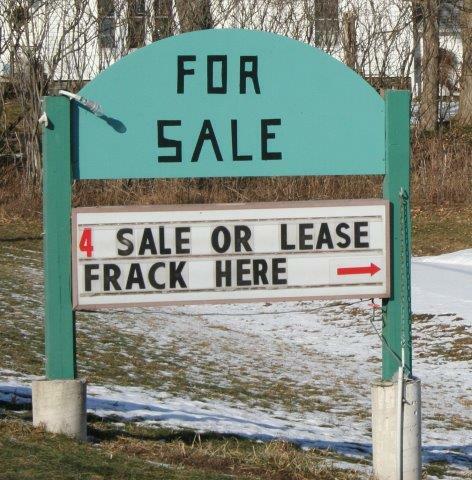 Tired of hearing industry folk claim that fracking has been used for at least 50 years? It hasn’t, say the authors, and they explain why. As a very short guide, The Science Beneath the Surface does a pretty good job. There are a couple places where information seems incomplete or lacking, for example well casings. 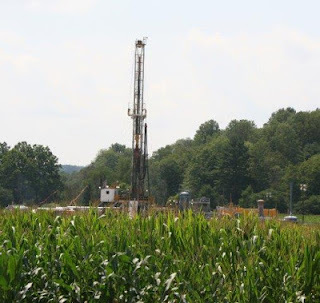 While the authors note that improper casings and casing failures have contributed to contamination of groundwater, they don’t say is how often this happens (6- 7 percent of the time in Marcellus wells drilled in Pennsylvania with a 60% failure rate over 20 years). And while they mention erosion regulations (SWPPP) they don’t say anything about federal exemptions from the Safe Drinking Water Act. Despite the small glitches, this book provides a thorough introduction to the science of shale and should be in the hands of every elected official in the state - especially if they want to make “science-based” decisions. Read my full review and comments from the authors at Tompkins Weekly. After 10 years of production, shale gas in the United States cannot be considered commercially viable. That’s the report from scientists meeting this past Monday in Denver, CO for the Geological Society of America. According to a report in Science News, the scientists report that while the use of hydraulic fracturing and horizontal drilling for "tight oil" is an important contributor to U.S. energy supply, it is not going to result in long-term sustainable production or allow the U.S. to become a net oil exporter. Two recent studies – one of the global patterns of fossil-fuel production in the past decade, and the other of oil production patterns from the Bakken Field – show that “despite a tripling of prices and of expenditures for oil exploration and development, the production of nearly all countries has been stagnant at best and more commonly is declining. 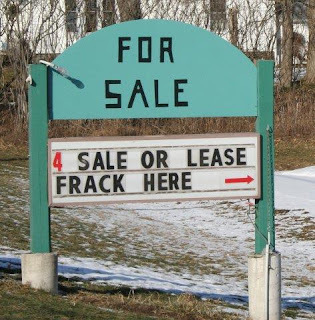 We may not have any fracking – well, at least not horizontal hydraulic fracturing – going on in New York, but there’s plenty of infrastructure being built to transport, liquefy, and store fracked gas. And to ship it overseas – which will only drive those winter gas heating prices higher. Not only do these fracking infrastructure projects “pave the way” for future industrialized “fracked” drilling, but it reinforces our already entrenched dependency on fossil fuels. They also vent methane into our air – a climate-changing emission much more potent than carbon dioxide – and threaten public health and safety. The DEC draft rules for Liquefied Natural Gas (LNG), which would permit LNG facilities of any size throughout the state, promote massive industrialization, and endanger communities. If adopted, the rules would lift a prohibition on new LNG facilities in New York State - a prohibition put in place in 1973 after an explosion on Staten Island killed 40 people. 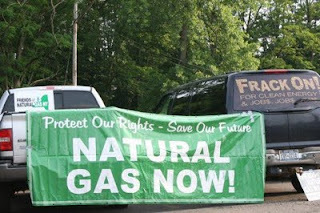 The FERC review of the Natural Gas Storage expansion plan, which would bury natural gas in underground salt caverns and turn the Finger Lakes region into a major storage and transportation hub for gas. The project on Seneca Lake threatens the drinking water for 100,000 people. The Port Ambrose Liquefied Natural Gas (LNG) port, near the entrance of New York Harbor. This proposed floating "port" would connect ships to onshore gas infrastructure and allow for the import and export of LNG. It would also discharge toxic chemicals into a fishing area and wildlife migration route. 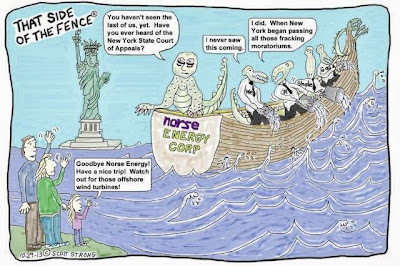 The scoping comment period for this mega-project ended in August, but Governors Cuomo and Christie can still veto it. To help us learn more about the science and regulations for these projects, Sandra Steingraber has once again created a “30 Days of Comments” website. Today's science lesson is about methane. The regulations don't mention anything about venting methane into the atmosphere, or about recapturing it. Why not, asks Steingraber. Why not indeed? Update: as of Sept 20, Colorado reports 22,000-plus gallons of oil spilled. Oil and gas crews are out and about in Colorado after the flood, and at least 5,250 gallons of oil have spilled from tanks into the South Platte River. Nearly 1900 oil and gas wells have been shut down and hundreds of industry crews are assessing damage. In addition to the tank spill there is one pipeline rupture and other pipelines that have been compromised by the flooding. Read more from yesterday's Denver Post article. Meanwhile, some members of Frack Free Colorado went out with their video cams to collect footage of damage to wells and storage sites in their area in Weld County. They note that while getting the footage they developed headaches, burning skin, eyes and throat. The air smelled strongly of chemicals. 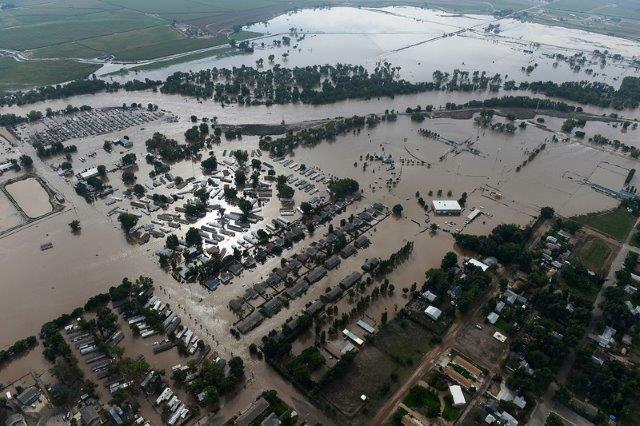 The rain pummeling Colorado this past week caused epic flooding. Photos show miles of devastation: homes lost, crops underwater, surviving livestock on flooded pastures, people in shelters. In addition to rescuing stranded people, emergency crews have also had to contend with broken oil and gas pipelines - and those that haven't broken yet are exposed due to eroded ground. According to reports from the Denver Post, "Oil drums, tanks and other industrial debris mixed into the swollen river flowing northeast. County officials did not give locations of where the pipeline broke and where other pipelines were compromised." Weld County is home to about 20,000 oil and gas wells, and companies have been drilling on the flood plains. Once the gas and oil companies were notified of the threats, they began shutting down drilling operations and transmission pipelines. 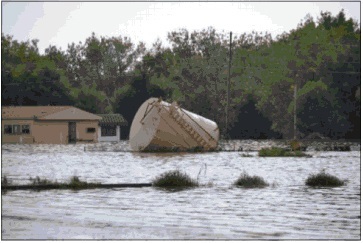 Even so, that still leaves wells, tanks, gathering lines and transmission lines in the path of raging waters. In a statement to the press Gary Wockner, of Clean Water Action, said "Fracking and operating oil and gas facilities in floodplains is extremely risky. Flood waters can topple facilities and spread oil, gas, and cancer-causing fracking chemicals across vast landscapes making contamination and clean-up efforts exponentially worse and more complicated." What does a flooded gas well look like? Here's a video that was posted to Facebook Friday evening. No one expected this type of flooding: it's a one-in-500-year type of event, aided in part by hillsides denuded of trees resulting from wildfires over the past couple years. 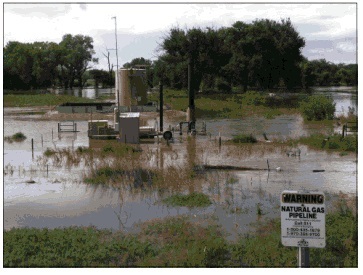 Even so, the results illustrate the risks of drilling in flood plains. 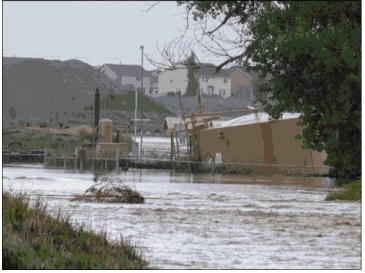 Even when the company shuts off the drilling or shuts down a pipeline, there is little they can do to prevent flood waters from ripping tanks from their moorings or washing frack pit waste downstream. update: check Texas Sharon's excellent blog, Blue Daze for updates on this issue. that Chesapeake "breached its duty" by basing royalties on the market value of the gas prior to refining – at “below market” price. Peter Saltonstall and his wife, Tacie, own King Ferry Winery. The small farm winery, located on the east side of Cayuga Lake, recently received a gold medal for their semi-dry Riesling. For some reason, Finger Lakes wineries do well when it comes to winning awards. So well, that Governor Andrew Cuomo often mentions wineries when touting NY products and agricultural achievements. The governor also puts a lot of energy - publicity-wise - into touting NY state agriculture, and in particular, the growing organic sector. These are examples of economic growth for the state, he says. So why, if he values the wineries, organic farms, Community Supported Agriculture projects, farmer's markets, dairies.... why does he still waver on fracking? Time and again researchers and farmers have demonstrated how destructive industrialized drilling can be on agricultural land. Industrialized gas drilling harms dairy farmers and ranchers, can affect crop yield, and raises food safety issues. One of the biggest issues is land use; industrialized drilling in Pennsylvania is taking over the agricultural landscape. Last summer Peter took his camera on a plane trip along the Susquehanna River, shooting footage of farms, fields, forests, and gas pads, pipelines, and other infrastructure. With the help of Ithaca College Park Productions he created a travel-documentary that shows what drilling looks like in Pennsylvania's northern tier. He also raises concerns regarding the impacts of hydro-fracking on NY's farms and wineries. The next morning it had another tree for breakfast. This is what the sinkhole looks like now - video from a flyover later on the 22nd. How big do these things have to get before someone decides enough is enough? So, what do a salt cavern and fracking have to do with each other? This is the question a curious reader asked earlier this morning. Salt caverns, it turns out, make great places to store gas (or propane). Right now, on Seneca Lake just north of Watkins Glen, NY the Inergy company is converting the salt caverns to a gas storage facility. 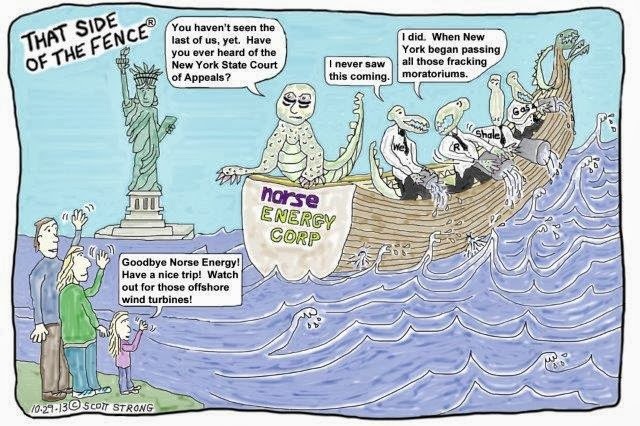 The problem: that the NY Department of Environmental Conservation (DEC) review leaves many questions unanswered - and DEC hasn't responded to the queries by residents in Watkins Glen and around the lake. 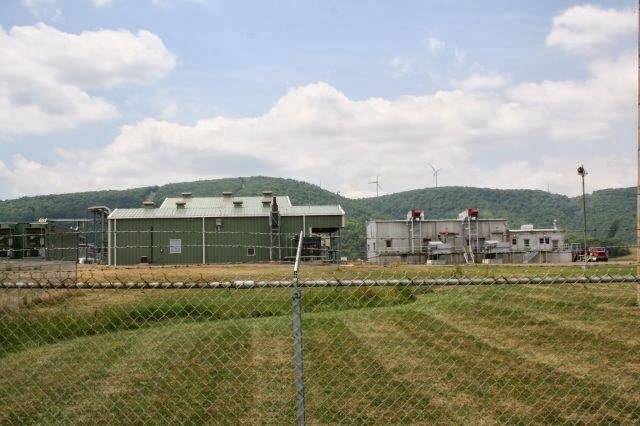 What people know: the storage facility is being built to hold gas from all the new (fracked) wells being built in PA and OH. What they don't know: that the caverns won't collapse any further than they already have. They don't want a sinkhole like that in Assumption Parish. And the Keystone connection? So many... let's just start with lack of good regulatory oversight (spills, pipeline breaks).